This green leafy vegetable is considered in the category of the healthiest plant foods. It is very rich in iron and is one of the principal resources of pigments, vitamins, minerals and phytonutrients. Thus we can say that it is a promising food with an array of health benefits. Apart from being low in fat and even lower in cholesterol, spinach is high in niacin and zinc, as well as protein, fibre, vitamins A, C, E and K, thiamine, vitamin B6, folate, calcium, iron, magnesium, phosphorus, potassium, copper and manganese. Thus we see that it is loaded with nutrients for every part of the body. Abundance of flavonoids in spinach leaves act as antioxidants and prevent cholesterol from oxidizing and therefore protect our body from free radicals. The folate in spinach is good for our healthy cardiovascular system and magnesium helps lower high blood pressure. It helps maintain our vigorous brain function, memory and mental clarity. It is loaded with various nutrients in a low calorie package. Dark, leafy greens like spinach are important for skin, hair and bone health. They also provide protein, iron, vitamins and minerals. It is bitter, pungent and astringent. It reduces kapha but increases pitta and vata. Spinach has alterative, refrigerant, demulcent, diuretic and laxative activities. Various health benefits that can be derived from the use of this vegetable are as follows. Spinach contains an antioxidant known as alpha-lipoic acid, which has been shown to lower glucose levels, increase insulin sensitivity and prevent oxidative stress-induced changes in patients with diabetes. Studies on alpha-lipoic acid have also shown decrease in peripheral neuropathy and autonomic neuropathy in diabetics. Spinach is very rich in potassium content and due to its high potassium content, it is recommended for people with high blood pressure. It can help reduce the effects of sodium in the body. A low potassium intake may be just as big of a risk factor for developing high blood pressure as a high sodium intake and therefore it is advisable to consume foods rich in potassium to reduce the chances of developing hypertension. Fat deposition leads to narrowing of the lumen of the arteries and can cause thickening of the human artery wall and this can lead to heart attacks. Spinach is rich in lutein content which prevents thickening of the walls of arteries thus reducing the risk of heart attack. Besides, it contains a high quality nitrite which not only helps in preventing the occurrence of heart attack but also cures the heart diseases associated with fat deposition. Spinach contains neoxanthin and violaxanthin, the two anti-inflammatory chemicals that regulate inflammation. Thus, it is beneficial in preventing and controlling inflammatory diseases such as arthritis, osteoporosis, migraine and asthma. Vitamin A in spinach is a key component of white blood cells that fight against the infection. It protects and strengthens the entry points into the human body, such as mucous membranes, respiratory, urinary and intestinal tracts. One cup of spinach provides as much as 337% of the RDA of vitamin A. Regular consumption of spinach can prevent anaemia as it is a very rich source of iron. The presence of this mineral in diet in sufficient quantity is particularly important for menstruating women and growing children and adolescents. It is much better to consume spinach for iron than red meat as it provides a lot less calories and is fat and cholesterol free. Iron is also needed for good energy as it is a component of haemoglobin which carries oxygen to all cells of the body. Spinach is rich in vitamin B which protects the skin from the harmful ultra violet rays that cause skin damage, skin cancer and pre-mature ageing of skin. Spinach is loaded with lot of antioxidants that destroy free radicals in our body. These free radicals damage the skin, thereby causing pre-mature ageing. Thus, eating spinach regularly will supply the antioxidants and help maintain the health & natural glow of the skin and slow down age related degeneration, making skin look younger and rejuvenated. Vitamin K reduces neural damage in the brain in patients suffering from Alzheimer's disease. Being a rich source of Vit K, regular use of spinach can be helpful in the prevention of Alzheimer's disease. Low intake of vitamin K has been associated with a higher risk of bone fracture. Adequate vitamin K consumption is important for good health, as it acts as a modifier of bone matrix proteins, improves calcium absorption and may reduce urinary excretion of calcium. A cup of boiled spinach provides around 1000% of the RDA of vitamin K which lowers and controls the over-activation of osteoclasts. These are the cells that aid in breaking down the bone structure over a short period of time. Vitamin K also promotes the synthesis of osteocalcin, the protein that is essential for maintaining the strength and density of bones. Consuming more of spinach, supplies plenty of beta-carotene and vitamin C which protect the cells of the body's colon from the harmful effects of free radicals. Besides, folate prevents DNA damage and mutations in colon cells. Iron deficiency is a common cause of hair loss. Regular intake of adequate iron rich diet can compensate for the iron deficiency. Spinach is certainly a very rich source of iron and therefore can be helpful in treating hair problems. Apart from iron, spinach is high in vitamin A, which is necessary for sebum production to keep hair moisturized. Spinach and other leafy greens high in vitamin C are imperative for the building and maintenance of collagen, which provides structure to hair. Spinach leaves can be beneficial in weight reduction as it is very low in calories and fat contents. It is very nutritious and has a good quality of fat soluble dietary fibre. This fibre aids in digestion, prevents constipation, maintains low blood sugar and curbs overeating. Spinach is a very rich source of antioxidants lutein and zeaxanthin, which are known to protect the eyes from cataract and age related macular degeneration. Zeaxanthin is an important dietary carotenoid which is absorbed into the retinal macula lutea in the eyes, providing light filtering functions. It also contains vitamin A, which is required for maintaining healthy mucus membranes and essential for normal eyesight. Spinach leaves are rich in flavonoids a phytonutrient with anti-cancer properties. Thus, it has been found to be effective in slowing down cell division in human stomach and skin and thus slows the growth of cancers. Spinach has also proven to be effective in providing protection against the occurrence of aggressive prostate cancer. 1. Cut the lower sticks of spinach and wash spinach leaves properly. 2. Cut the onion, green chillies and spinach. 3. Boil the chopped onion with a little water for about 10 to 15 min. 4. Boil the spinach, green chillies & garlic-ginger paste the same way for 15 min. 5. Blend all of the boiled ingredients together into a smooth pulp. 6. Heat the ghee in a pot, and fry the minced garlic for a minute. 7. Add the pulp, salt and bring to boil. 8. Add milk and boil for 5 to 10 min. Spinach is very rich in iron and is one of the principal resources of pigments, vitamins, minerals and phytonutrients. A low potassium intake may be just as big of a risk factor for developing high blood pressure as a high sodium intake and therefore it is advisable to consume foods rich in potassium to reduce the chances of developing hypertension. Consuming more of spinach supplies plenty of beta-carotene and vitamin C which protect the cells of the body's colon from the harmful effects of free radicals. Spinach is a very rich source of antioxidants lutein and zeaxanthin, which are known to protect the eyes from cataract and age related macular degeneration. 1. Spinach is high in oxalic acid content which can bind with iron and calcium and cause our body to absorb less of these nutrients. Consuming foods rich in vitamin C, such as tomatoes, capsicum, lemon juice or orange juice along with spinach can augment the absorption of these nutrients. 2. It is high in fibre, but too much of it can cause digestive problems such as bloating, gas and cramping. 3. It is also associated with an increased risk of kidney stones, but only in people who are predisposed to the condition. 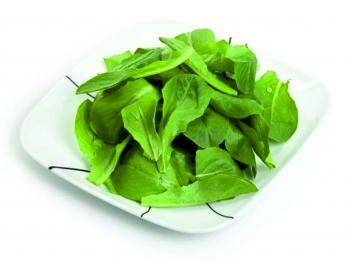 Spinach (Spinacia oleracea), raw, Nutritive value per 100 g.